Statistical Skier : How Old Are World Cup Skiers? How Old Are World Cup Skiers? Sometimes it’s a good thing to ask basic questions that everyone thinks they know the answer to. Sometimes you get surprising answers, sometimes not. So, how old are World Cup skiers? 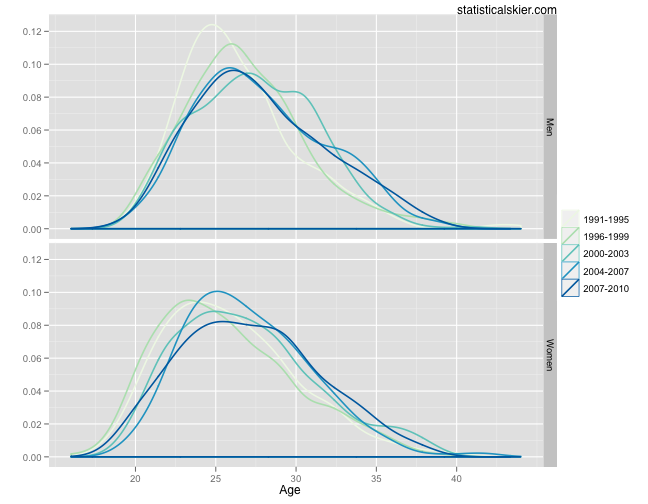 In general, World Cup skier ages tend to center around 25-26. These distributions all have a slight right skew, which just means there tend to be some more unusually large values (i.e. older skiers). So far, this isn’t surprising at all, it’s about what we’d expect. The one interesting thing that does pop up is the slight trend toward older skiers in recent seasons. As we move forward through time, the distributions move (slightly) to the right, and you can notice that the darker colored curves (recent) tend to be above the lighter curves (less recent) for the older skiers. So it would appear that (within this time frame, at least) World Cup skiers have become slightly older. Posted by Joran on Friday, October 22, 2010, at 8:21 am. Filed under Uncategorized. Tagged Age, trends, World Cup. Follow any responses to this post with its comments RSS feed. You can post a comment or trackback from your blog.